Leaf through the latest newsletter from OBMSA! 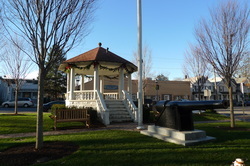 In cooperation with the Town of Oyster Bay and local merchant Main Street Nursery, the Oyster Bay Main Street Association is pleased to announce the renovation of the public park in between the historic Oyster Bay Post Office and the historic Oyster Bay Town Hall known as Townsend Park. The third cycle of our privately funded Facade and Sign Grant! We are currently halfway through the grant cycle and will be accepting applications on a rolling basis until August 11, 2015. Since 2013, we have invested over $20,000 into the downtown, assisting 12 new and existing businesses... Continue Reading. To find out if you are eligible for assistance or to download an application, click here. We are pleased to announce that, through the generous support of Mill-Max Mfg. Corp and the Oyster Bay-East Norwich Chamber of Commerce, two additional locations in the downtown have been improved. Since August of last year, three participants in the program have adopted and pledged to maintain three high visibility sites, which serve as the gateways to our downtown, including locations on West Shore Road, Cove Road and Berry Hill Road. For more information about the West Shore Road improvement click here. purchase is donated to our organization in your name.